Can you buy an SACD for a single track? The Best SACD Track ever? With rising prices for everything from used LPs to new SACDs and downloads, can you really justify buying an album just for a single track? I guess all audiophiles have bought many discs to get their favorite track, just to find out the audio quality made the purchase a complete loss. I was thinking about my overall batting average for album purchases. Perhaps 1 of 4 is in rotation. The rest is space filler on various shelves and in boxes. That means my real cost for records is about $100… No wonder there’s a good market for re-issued albums. I have the 24-Karat Gold Compact Disc version of Colors of the Day, the Best of Judy Collins (GZS-1130 release 1998). This is a collection of tracks from four Judy Collins albums, which was released in 1972 as an LP. At this vintage all tracks are analog recordings. 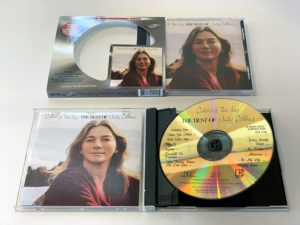 The CD was mastered by Steve Hoffman with an ‘all vacuum-tube cutting system.’ The case has a cool pop-up system that presents the record when the lid is opened – nice! The Gold CD was obviously a decent improvement over the regular CD. My main target for buying this Redbook CD is the last track – “Amazing Grace,” performed a cappella with a choir recorded in St. Paul’s Chapel at Columbia University – which was a big hit for Judy Collins. The track is as good as you can expect from a CD. It has a bit of tape hiss but decent range and not too much dithering. However, it has the all the flaws of [non-audiophile] Redbook. The top is severely restricted, which doesn’t do justice to this a cappella track. Obviously, an SACD would solve this problem. Audio Fidelity has issued a Limited Edition of Colors as a hybrid SACD (AFZ5 220). It has Stereo CD and SACD mixes as well as 4.0 multi-channel SACD tracks. Steve Hoffman is at it again with Stephen Marsh. I quickly bought it, again, to get the improved version of ‘Amazing Grace’ – hoping for an amazing audio experience. Well – no luck. For some reason the remastering removed the tape hiss but also the expansive feeling of the church. So a record for my never-played archive? I later revisited the album and was stunned by another track – “In My Life,” the old Paul McCartney Beatles song. This is Judy with some acoustical guitars and a bass. It’s a fantastic recording and transfer to SACD. It feels like Judy is immediately in front of you, her voice is natural and absorbing, the instruments are exquisitely detailed, the background is jet black and the sound stage is close and realistic. It appears that this was played live in the studio and recorded without any additional overdubs. It’s easily the best sounding track on the album. Not only that, it is also the best track in my extensive SACD collection. In My Life is an excellent reference for anyone with an SACD player in his or her system, and a great reason to get one if you don’t. I often use it to demo my system to visitors. I was able to find a pre-owned Colors of the Day LP at an audio show. The SACD is considerably better than the vinyl version. Possibly a perfect copy of the LP would also be OK but good luck finding a perfect pressing of a bestselling album. There’s a new pressing available, which I haven’t heard. I suspect it’s made from the digital new master. One outcome with Judy’s “In My Life” is that it has become difficult to listen to the Beatles version without cringing. So, yes you can buy an album for one track. But it may not be the one you thought. Judy Collin’s “In My Life” is my candidate for the Best SACD Track Ever.